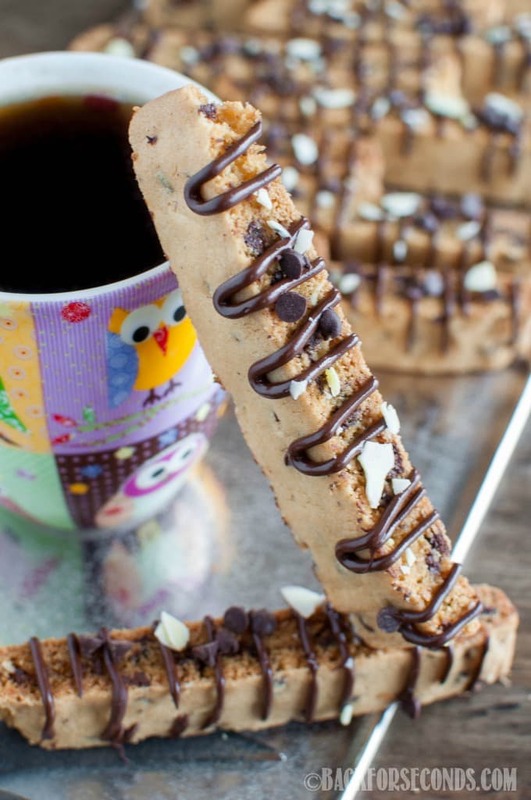 Chocolate Chip Almond Biscotti – the perfect companion to your afternoon coffee. 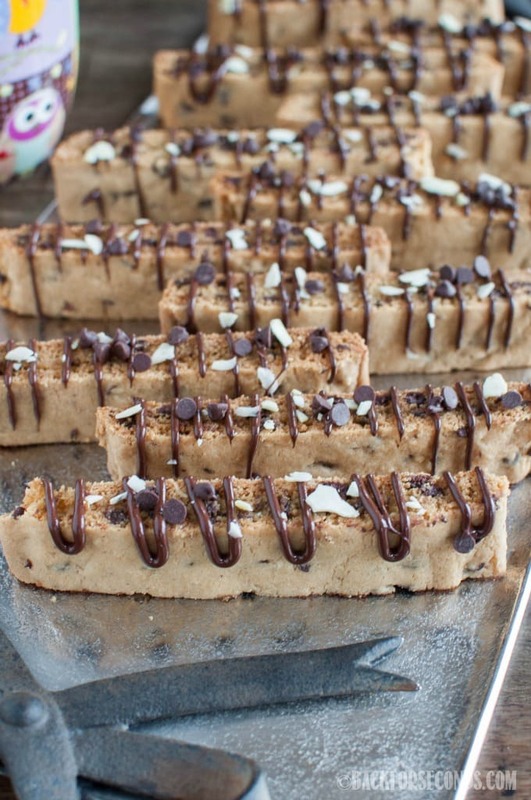 Crunchy almond cookies studded with chocolate chips and a chocolate drizzle! At Christmas time I made these Chocolate Peppermint Biscotti again, and it reminded me that I need to make biscotti a lot more often. It is SO SO good!!! I am usually soft and chewy cookie type of person, but there is something about crisp, crunchy biscotti that I cannot resist! If you haven’t made biscotti before, or you think you don’t like it – I encourage you to give it another try! Dip them is coffee, milk (or chocolate milk) and enjoy!! 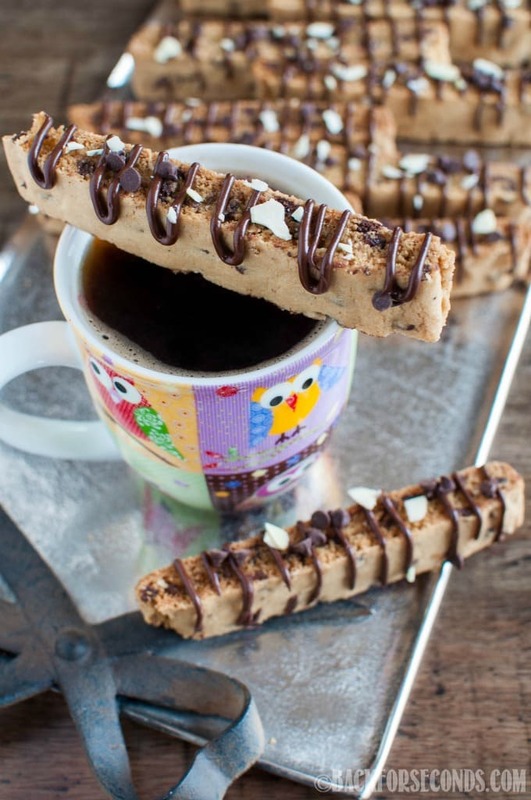 Biscotti is actually super easy to make. You don’t have to scoop a million balls of dough like with regular cookies. Just bake it in one big log, slice and bake gain, flip and bake again. Done! I like to add drizzled of chocolate and other toppings just to make them pretty, but it’s totally not necessary. They taste awesome either way! In the afternoons, when I lay the baby down, I make a cup of coffee to enjoy while I work. And let’s face it, usually a cookie is involved as well 🙂 I think it’s so cute when I sit with my coffee, dipping biscotti, my 4 older kids ask for a cup of milk and their own biscotti too. It’s like our own little Italian cafe here at home! I love the flavor the almond extract gives these cookies. It pairs so wonderfully with the chocolate chips and almonds. My daughter said these are the best biscotti we’ve made yet! Those look perfect! I’d love to have some for dunking right now! I could go for these and a big cup o’ joe right now! 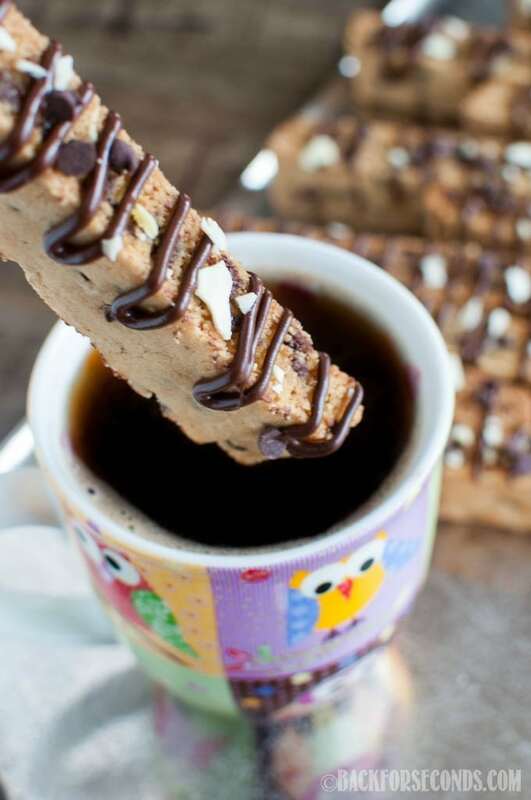 I grew up dunking biscotti in coffee. This sounds so perfect’!